Living in a bungalow in Bishop Auckland, England, Kathleen Eltis seemed destined to create creatures. As a child, Kathleen discovered that she liked to make things. She reasons it was because she was an only child and didn't have a television. "I got bored easily and I had a very vivid imagination in which I would weave stories about imaginary creatures from another world." 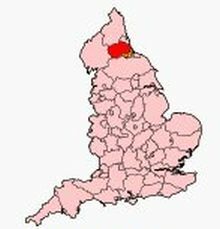 Her much loved toys, Teddy, Sooty and Golly, which were given to her as a baby, would also play in her little world. "Perhaps this vivid imagination is now reflected in my bears." Kathleen watched her mother and grandmother knitting, sewing, crocheting and embroidering. "Mum made my dresses on a Singer treadle sewing machine which I begged her to let me use at an early age." Her mother obviously thought that this was not safe, so one Christmas she bought Kathleen a Little Betty sewing machine which she and a friend used to start creating doll clothes. "I'm not sure how old I was when my Mum finally gave in and let me use a proper machine, but I would guess I was about eight." From then on, Kathleen never looked back. Although she tried other crafts, it was her passion for sewing, designing clothes and interior decorating that would make the biggest impression. "By the age of 15, I was making all my clothes and tweaking patterns to put my own particular stamp on them. As the need arose, I learned to re-upholster and renovate furniture." With no particular desire to continue her academics, at 15 Kathleen left school and worked in dress manufacturing company for two years; learning how to pattern grade and make patterns from the designer's ideas. I learned as much as I could. I decided to pursue my dream and took classes to become a needlework teacher. I then went on to study art and design and English to qualify as a teacher." In 1979, she started her teaching career which would go on for another 30 years. Her teaching later gravitated to helping pupils with emotional and behavioral difficulties. Sometimes she dipped her hands into the wonderful world of textiles or art and design with her students. Towards the end of her teaching career she taught textiles and food technology. It was there that her love of textiles was rekindled and put to good use making and designing bears. On a trip to London, she had some time to kill and wandered into a book shop at Kings Cross and bought a teddy bear making book. "Thinking I could possibly use it in school, I bought the book and then made my first bear." From there her bear making took off. "I spent all my available spare time making and designing bears. Then I started a bear making class, after school, for some of my enthusiastic pupils." The bears proved to be very popular and gave her the confidence to set up her own web site and try to sell her bears. "The only problem was what to call them. After some debate and help from the department at school, Bearlytherehugs was born." 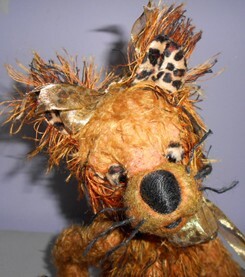 From there, she developed her ideas in bear making, changing from traditional bears to creating her own individual bears, the first of which she called Poggles and they have become a popular addition to her bears. "I then designed Troggles with needle felted features, Trogglets which are smaller bears with felted clothes and Moggles which are furry and wacky cats. Kathleen does a bit of traveling exhibiting her bears. "It's great to see so many bear artists under one roof. It is well worth traveling so far, seeing such diverse skills and like minded artists in addition to selling my own bears." Kathleen continues to take classes and develop her styles. "I wasn't sure if I should have put myself under so much pressure," she said after entering her work in several competitions, "but I think I have developed my own style whilst producing new ideas for the artist events. As the say nothing ventured; nothing gained!" 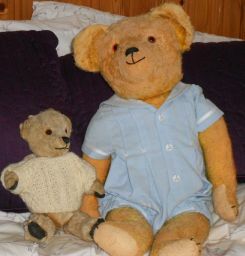 Freddy ( on the left) before restoration. 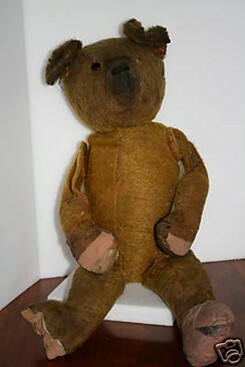 Shown Above: Freddy after restoration with my Ted given to me by my Grandpa when I was born.